What exactly is restorative justice? Maybe you’ve heard a little bit about Michigan’s new law encouraging schools to replace damaging zero-tolerance policies like suspension or expulsion with restorative practices. What exactly is restorative justice? What philosophy and research underpin this new trend in education? If you have such questions, we might be able to help. 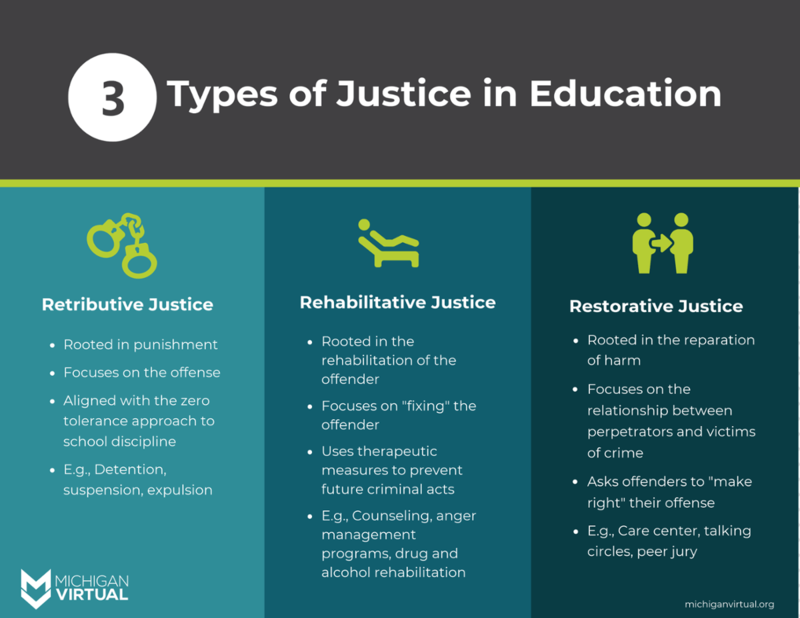 Keep reading to learn more about restorative justice and how it differs from previous paradigms of school discipline! Restorative justice isn’t just a technique or tactic. It’s a paradigm shift in the way schools think about discipline that asks educators to fundamentally challenge their perceptions of students who violate school policies. Rather than viewing students who commit crimes as criminals, it asks educators to view them as responsible community members. The following infographic shows three different paradigm shifts that have occurred in education in recent decades. Following this trajectory from left to right, you can see how the way we think about justice (and criminals) has evolved. Zero tolerance falls under the paradigm of retributive justice. This approach hones in on the offense itself and operates by punishing the offender for committing crimes. In this system, justice is a set of rules that cannot be broken without the perpetrator getting retribution for his or her infraction. Examples of this system include detention, suspension, and expulsion. Another popular approach is called rehabilitative justice. Rather than focusing on the offense, this approach focuses on the therapeutic rehabilitation of the offender. Examples of rehabilitative justice include counseling, educational programs, or anger management courses. While they share some overlap, restorative justice takes a different approach yet. Rather than focusing on “fixing” the offender, it focuses on repairing the relationship between the victims and the perpetrators of a crime. One major difference between restorative justice and previous paradigms is the active role of the victim. In most previous approaches, the victim was entirely left out of the process of justice. By involving the victim in the work of justice, this approach encourages the reparation of harm. Restorative justice encourages the use of support systems — such as talking circles, peer juries and trusted adult counselors — to facilitate a conversation between victim and offender. The goal is for the perpetrator to hear how their actions have affected the victim, from the victim’s perspective. This approach humanizes both sides by giving students the chance to understand one another and learn to express their vulnerabilities. Further, it helps bring the perpetrator back into the school community, rather than further excluding them. It also asks the offender to find an appropriate way to make amends with the victim. One common misconception about restorative justice is that it does away with discipline completely. Parents — who generally push for zero tolerance policies — often hear “restorative justice” and assume the school environment is going to become chaotic and dangerous. The chart below — called the “Social Discipline Window” by researchers — reveals how approaches to discipline change with high vs. low control and support. When support and control are both low, discipline is neglectful. When support is low but control is high, it’s punitive. When support is high but control is low, it’s permissive. But when support AND control are both high, that’s when discipline becomes restorative. To create a disciplinary system that is both highly supportive and highly controlled. When implemented in a way that is both highly supportive and highly controlled, research suggests that school-wide use of restorative practices can have long-term, sustainable effects, including positive impact on student behavior, attendance, and achievement, as well as an overall improvement to school culture. Of course, there’s no quick-fix, silver bullet solution for righting the institution of school discipline. It takes time, effort and a whole lot of patience to create a school culture around restorative rather than retributive justice. You can learn more about the history, research and implementation of restorative practices by reading the rest of our blog series on Restorative Justice in Michigan Schools. If you like our infographics and want to share them with your colleagues, you can find them all compiled in this Pinterest board.